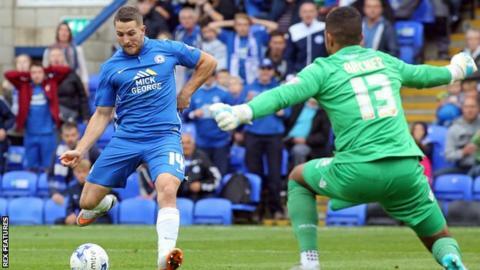 Peterborough United have rejected three bids for forward Conor Washington, according to chairman Darragh MacAnthony. The 23-year-old, who joined from Newport in January 2014, has scored 14 goals in 29 matches this season, 12 of which have come in his last 13 games. His form in League One has seen him linked with Championship side Reading. But MacAnthony said he has rejected two bids from ex-Premier League clubs and one from "a large Championship club". He said on Twitter: "I value our young squad, know their talent and they trust that when and if right deal comes along, Ill do right by them and our club. It's our policy." Peterborough are currently sixth in League One and host Championship side Preston in the FA Cup third round on Saturday.